Piling on the greens not only celebrates spring and makes your cooking sing, it leaves you feeling lighter and healthier at the end of the meal. 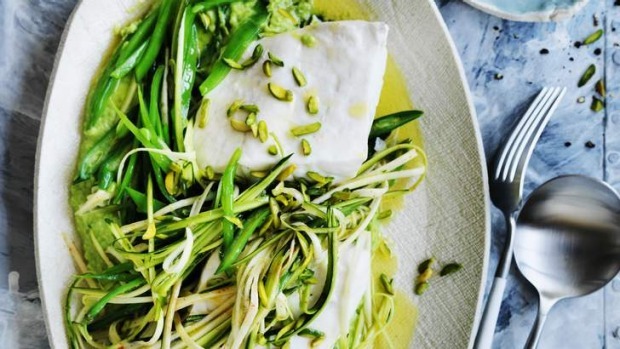 Lemony spring greens and a perky green pea and parmesan dressing can rev up a simple, holier-than-thou meal of steamed fish. 1. To make the pea puree, cook 200 grams of peas in simmering, salted water for one minute. 2. Scoop out the peas with a slotted spoon and whiz in a mini-blender with two to three tablespoons of the cooking water, one tablespoon of olive oil, grated parmesan, sea salt and pepper until very smooth. Set aside. 3. Add the green beans, zucchini, snow peas and remaining 200 grams of peas to the simmering water and cook for two to three minutes or until the beans are tender. 4. Season the fish and steam gently in a steamer over simmering water for four minutes until cooked through. 5. Drain the vegetables and toss with two tablespoons of olive oil, lemon juice, paprika, sea salt and lots of pepper. 6. Arrange on four warm dinner plates with the fish. Spoon on the pea puree, scatter with pistachios, coriander or mint, add a swirl of olive oil and serve.